Apartment with Shared Seasonal Pool and Private Terrace with Sea View in Sorrento Centre. The Caruso apartment is approximately 160 meters squared, spacious and bright, located in the heart of Sorrento just a few meters from the beach. It has 3 bathrooms and is ideal for up to 6 people. 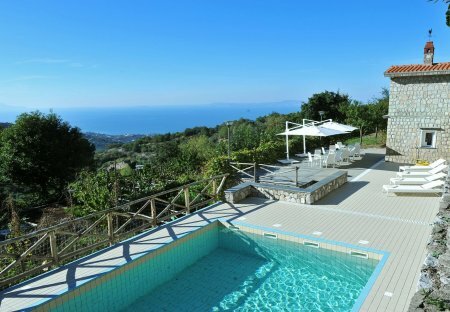 Villa Gioiello is in the most exclusive residential area of Sorrento, the most famous and lively town in all the “Penisola Sorrentina”, just a few steps away from all the main landmarks. This 2 bedroom apartment is located in Sorrento and sleeps 4 people. It has WiFi, air conditioning and garage. The apartment is within walking distance of a beach. APARTMENT ERICA is a beautiful three-room apartment laid out over an area of 100 square meters, on the fourth floor of a stately building nestled in the heart of Sorrento. MAISON PALAZZO CORREALE is a nice and bright apartment of about 160 square meters located in the main center of Sorrento, a few meters away from the beach. GILDA'S HOUSE is a characteristic and bright apartment located just a few steps away from the sea, ideal for up to 6 guests.